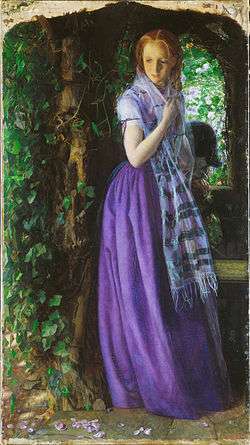 Arthur Hughes (27 January 1832 – 22 December 1915) was an English painter and illustrator associated with the Pre-Raphaelite Brotherhood. Hughes was born in London. In 1846 he entered the art school at Somerset House, his first master being Alfred Stevens, and later entered the Royal Academy schools. Here he met John Everett Millais and Holman Hunt, and became one of the Pre-Raphaelite group of painters. His first picture, Musidora, was hung at the Royal Academy when he was only 17, and thenceforth he contributed almost annually not only to the Royal Academy but later also to the Grosvenor and New Gallery exhibitions. In 1855 Hughes married Tryphena Foord, his model for April Love. Hughes died in Kew Green, London in 1915, leaving about 700 known paintings and drawings, along with over 750 book illustrations. Following the death of Tryphena Hughes in 1921, their daughter Emily had to move to a smaller house. There was, therefore, a shortage of space. As a result, she had her father’s remaining preparatory sketches, and all his private papers and correspondence, destroyed. He was the father of the English painter Arthur Ford Hughes and the uncle of another, Edward Robert Hughes. Hughes is buried in Richmond Cemetery. His best-known paintings are April Love and The Long Engagement, both of which depict troubled couples contemplating the transience of love and beauty. They were inspired by John Everett Millais's earlier "couple" paintings but place far greater emphasis on the pathos of human inability to maintain the freshness of youthful feeling in comparison to the regenerative power of nature. Like Millais, Hughes also painted Ophelia which is housed at Toledo Museum of Art and illustrated Keats's poem The Eve of St. Agnes. Hughes's version of the latter is in the form of a secular triptych, a technique he repeated for scenes from Shakespeare's As You Like It. His works are noted for their magical, glowing colouring and delicate draughtsmanship. The beautiful oil portrait Springtide, first exhibited in Dublin in 1855, features his wife Tryphena. 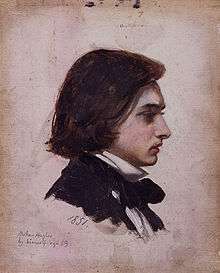 Hughes was in close contact with the writer George MacDonald and illustrated some of his books, as well as producing numerous illustrations for Norman MacLeod's monthly magazine, Good Words. List of Pre-Raphaelite paintings - includes catalogue of Arthur Hughes' work with links to individual paintings' articles. ↑ One or more of the preceding sentences incorporates text from a publication now in the public domain: Chisholm, Hugh, ed. (1922). "Hughes, Arthur". Encyclopædia Britannica (12th ed.). London & New York. ↑ "Death of a well-known artist". Western Daily Press. 24 December 1915. Retrieved 22 January 2016. ↑ "Four Figure Studies". Birmingham Museums & Art Gallery. Retrieved 4 January 2016. ↑ Meller, Hugh; Parsons, Brian (2011). London Cemeteries: An Illustrated Guide and Gazetteer (fifth ed.). Stroud, Gloucestershire: The History Press. pp. 290–294. ISBN 9780752461830. Wikimedia Commons has media related to Arthur Hughes.